Last night, Krista and I met up at the Rock Bottom Brewery, had some delicious mac & chicken & cheese and steak tips, accompanied by a couple of beers, natch, and headed off to see Ray Davies at the Orpheum. and is desperately in need of renovation. It’s a shame they (whoever “they” are) don’t do anything about this. Ray was…ok. He was Ray, meaning he was demanding, impatient, took too long to start, took too long of a break, played too many songs off his new CD and not enough old ones for my taste. Although…the ones he DID do were fantastic! 20th Century Man (1st song on my iPod), Sunny Afternoon & Low Budget (LOVE that one, hadn’t heard it in years) were a few I particularly like. He did look like he was having a good time, tho and the fans LOVED him. Hey I love this layout!! Thank you for stopping by my blog. -other countries cherish the old treasures and keep them restored as best they can…..they are priceless! 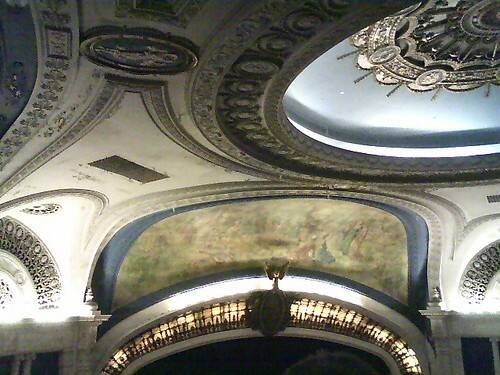 I think every city has an Orpheum in need of renovation. I wish I were rich and could rescue an old building or two. That is a beautiful ceiling. I hate to see old buildings fall into disuse. I’m all for building rescue and finding new and innovative ways to restore these historical structures.